Police are called to the scene of an accident. The driver is unconscious. In the back seat is an 8-year-old boy with blood coming from his forehead. The officer first on the scene sees the driver is unresponsive and the boy in the back is just staring at him. “Are you OK young man?” the officer asks. The boy doesn’t respond. He stares out the side window with a blank look. The officer, assuming the boy is in shock, flags the EMS responder to get to the boy. “My name is Dan. Are you OK? I’m here to help you. Your Mom is going to be fine. Just look at me.” directs the EMT. The boy continues to look out the window and makes no attempt to look at the EMT or police officer. He begins hitting his head with his fist and hollering in a monotone voice. The boy begins to flap his hands and shake his head violently. Meanwhile, the other EMT puts the driver in a neck collar and moves her to the ambulance. “I’m going to bring him in another wagon,” says the EMT with the young passenger. At that, the boy stops flapping and hollering. “Wagon?,” the boy repeated. “Wagon, ride wagon,” he said with his eyes wide. “Oh, you can talk! What’s your name?” the EMT questioned him again. Still there was no response to the question. Both ambulances arrive at the emergency room around 7pm. The mother is taken to the trauma bay, while the boy is taken to the other end of the ER, to room 10. The boy’s name remains unknown. The driver’s name is Margaret Hamstead. As the ER doctors work on the woman, the police are sent to the driver’s home to see if someone can identify the boy. There is no one there. The driver remains unconscious. The ER doc determines she has a subdural hematoma and requires immediate surgery. The boy is accessed by a different ER doctor. After repeated questions and no answers, the doctor calls the neurologist to see the boy. The child looks around continuously, trying to see how to get the side rail down. He finds the ophthalmoscope on the wall and plays with the light, shining it in his eye, on the ceiling, and in his mouth. An hour later, the neurologist arrives. “Hello there. What is your name? My name is Dr. Potts,” says the neurologist, a big round woman with rosy cheeks and a big smile. “Mrs. Potts! Where’s Chip? Where’s Chip, Mrs. Potts? Be our guest, Be our Guest,” the boy repeats with a smile. “How many fingers do you see?” she asks. The boy makes no response. He holds his fingers up to replicate the number she has up. Now he starts to get agitated and begins looking around. He tries to climb off the stretcher but the nurse comes and puts him back on the stretcher. He begins hitting her while he wrestles to get down. This is not that unbelievable or different from the scenario that plays through the mind of every parent or caretaker of an autistic child. In this case, it was lucky the doctor called a neurologist who had a clue and could decipher that it was not the head injury that was causing the inability to follow directions or communicate. Even though he was eventually identified as being on the autism spectrum in this scenario, they were still not any closer to having the child’s guardian or emergency backup family. They also didn’t have any concept of his medical background, medications, or things that would set him off or calm him down. Donna took her three children with her to the supermarket. The twin girls, Rachel and Ronda, were 12 years old and their brother, Michael, was 16 years old. The four of them always went to the shopping center together because Donna wanted them to learn how to shop for items themselves and practice adding in their head and estimating. One of these shopping days, Donna sent the twins to get fixings for spaghetti and French bread and salad for the dinner. Then she sent Michael to go get deodorant, toothpaste, shaving cream, and band-aids. The girls decided to split their task up between them. Michael went off to the personal items aisle. As Michael walked toward the personal items section he passed the movies and toy aisle. There he saw the newest Batman movie and picked it up to look at it. “We’re gonna beat you Michael,” taunted Rhonda as she passed Michael checking out the toy aisle. Michael quickly ran to the personal items aisle and grabbed the shaving cream and toothpaste. He couldn’t remember what the other items he was supposed to get. Frustrated, he started hitting his head and flicking his fingers. Now he has shaving cream, toothpaste, and a movie in his hand. He started pacing up and down the aisle trying to spot something that would remind him of what he was supposed to get. It was useless. Now he would lose to his sisters. Rachel and Rhonda had gathered their things and taken them to their mother’s cart. “I’m gonna wait in the car Mommy,” said Rachel and she skipped out the sliding doors. Michael caught a glimpse of Rachel running out the doors and thought they were leaving him so he ran after her with the items still in his hand. The manager saw Michael running out the door with merchandise in his hands and ran after him after calling for security. “Stop there, young man! Where do you think you’re going with that?” The manager hollered as Michael went running to the car after Rachel. Security ran out the other set of doors to head him off at the car. As security grabbed Michael’s arm, Michael started flailing his arms and fighting him off. Rachel was staring at the men and Michael fighting and started screaming. “Stop, stop, let go of him” she screamed. The security guard pulled out handcuffs and tried to put them on Michael. Michael started hollering “Momma, Momma, help Momma!” Donna and Rhonda were still in the store waiting at the checkout for Michael. While Rachel was screaming “We weren’t stealing anything,” they were walking back into the store. Donna’s ears perked up at the familiarity of her children’s voices. She left her cart and ran to the sound. She found both children handcuffed by the store manager and the security guard. Michael and Rachel were frantically calling her name while she tried to make sense of the situation. When she saw the items they confiscated from Michael she knew what happened. Explaining to the security guard and manager started with “My son is autistic…” Eventually they released the two kids and no police report was made. But this went well because Mom was there. What if she wasn’t? These are the kinds of incidents that happen every day in the 1 in 68 population of families of autism. My husband and I, like most of the parents with children on the spectrum, have explained to multiple people our children are both autistic and didn’t mean to hit, or bite, or spit, or run off, or steal, or any number of things that are interpreted as illegal or harmful or inappropriate. Wouldn’t it be nice if people could just “get it” and understand without us having to explain their behavior all the time? Unfortunately, there is no outward sign of autism for many on the spectrum. Police, store managers, security guards, ER doctors, nurses or EMTs aren’t mind readers or omniscient. 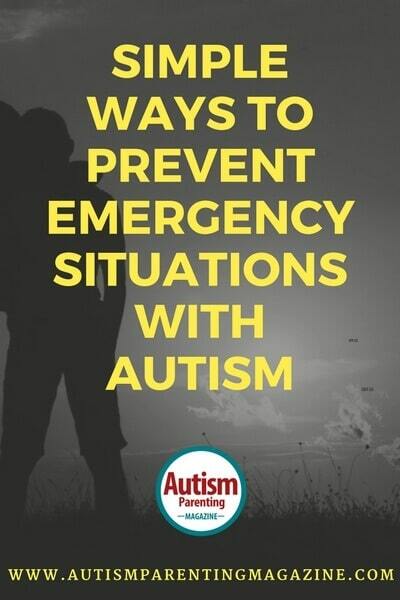 Even if they identified that the person was on the autism spectrum, it doesn’t mean they would know what to do or who to call. That is why my husband and I formed Autism FYI Org. and the AFYI National Registry. For more information about the organization and registry, go to www.autismfyi.org. So What Can You Do to Help Prevent Emergency Situations? Continue to be vigilant 24 hours a day, like you already are. Accept you have had years to learn how to interpret your child’s language, behavior, spirit, intentions, and others have seconds to make that determination, in an emergency. Understand their interpretations will be wrong unless they have someone in their life on the autism spectrum or have been taught what to look for and how to respond. Commit to teach others in your community about autism by exposing them to your child. Offer to give a sensitivity class and share resources available to learn about autism. Consider putting something on your child identifying them as being on the autism spectrum. This gives others immediate information special considerations are necessary in their interpretations and communications. Have your child carry an ID card with emergency information on it with different contacts and their phone numbers as well as tips on how to interact with them. Notify your local police and EMS team about your child and his or her diagnosis and ask them to add the information to the 911 information dispatch system. Make a point to let the local store personnel get to recognize and know your child so they are in the know when and if they see something out of the ordinary. Finally, consider registering them at Autismfyinationalregistry.org. This actually just lists the scary scenarios we all lie awake and think about with no concrete info to move forward. I have a sticker on my car to identify that my son is autistic, I have runners ID bracelet for him but that doesn’t help. I’m considering getting a business card info on him to put in my wallet for accidents. My daughter has a bracelet that has a clasp she cant open. On it has the fact that she has autism and is speech delayed and has my cell number and my moms cell number. She’s also taught that if she’s ever seperated from whatever adult shes with to go to a Mom with a little kid and show them her bracelet. We’ve role played this many times because shes a runner. One time I misplaced her for about 10 mins in ikea and she found a mom with a little kid to tell the security guards that were searching for her where.